Spurious signal off: ............................................... 20dB typ. A. embedded attenuator 25 or 50dB. B. embedded harmonic generator 100 MHz; or 10 MHz; or both. We can customize tracking generatos to various spectrum analysers. TR4131 is a wide-band instrument, working in a single range(!) from 10 kHz to 3700 MHz, and it is controlled by a microcomputer. It can also be controlled through a GPIB. The three control functions - central frequency, wobbling range and reference level, are controlled individually. The intermediate frequency bandwidth, wobbling time and input attenuator are controlled automatically, but can also be controlled manually. The three settings of the analyser, and also the measured signal, can be stored in a memory. 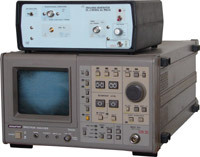 The instrument has the function of automatic search for the maximum signal and its centering on the screen. 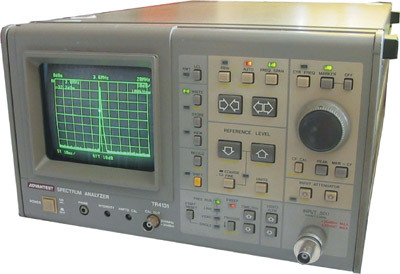 The measured signal is displayed digitally with the resolution of 0.05 dB. Frequency span............................................................................................... 0...400MHz / Div. Time / Div. ........................................................................................................ 5ms/Div....100s/Div.